What a pretty green. Hey, I saw you were in Vogue Knitting – cool! Oh goodness – don’t envy you trying to unpick that KSH – but it is a beauty so I hope you can salvage it. I loooove that Kidsilk Haze! I hope you get the cardigan to work because it is absolutely gorgeous! You were in Vogue Knitting?!?! 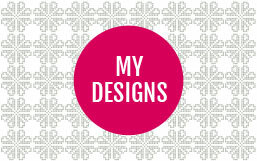 That is so pretty – I hope you can find a way to make it work for you! Good Luck, I imagine picking back KSH would not be fun. Look forward to seeing how your mods work out, sure they will be just great. I love that you are going to mod this after the fact. You are intrepid! Go for it. I’m with you – way too cute to give up on! oh I hope you can fix it too because it’s one of my favourites of yours. So delicate and pretty. Keep us posted! I’d give it a go. 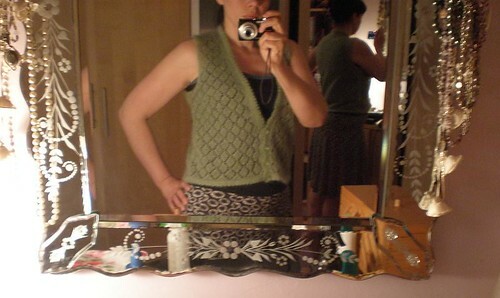 It’s a really beautiful cardigan – be a shame to leave it in an unfinished state. Wow, that ribbing has a very romantic effect on the design! 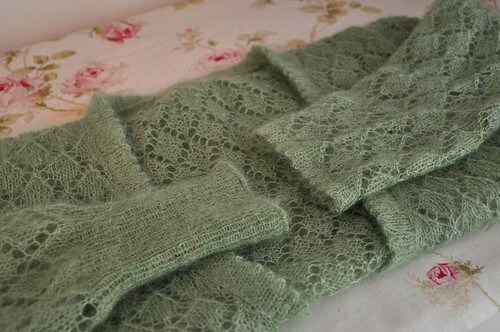 I think it would look very nice at the waist too— such a pretty cardigan! Go for it–it’s beautiful! My take: the biggest difference in “boxiness” would be made around the bottom hem, so I would go for the ribbing there. If you have more yarn, I’d make it a little longer, to sort of blend the ribbing into the body more. If you can keep the picot on the front edge, that’s where it shows the most. Also, it sounds a bit strange, but you might want to try, with scrap yarn, seeing if you can make a picot edge with ribbing, as it would look really pretty on the sleeve, and if it works, on the hem as well. My biggest hint: only do the frogging when you are relaxed and willing to take the time, as it will be time-consuming! But such lovely yarn seems really work saving! Good luck! it’s a beautiful cardi…all that work…please save it. Wow – I am in awe of your mohair frogging skillz!! I really like the ribbed edging, I think it works really well. And it is such a lovely colour, it seems a shame not to give it a go. I’m finally caught up on your blog–hurrah! It is such a pretty lace pattern. You are a brave woman to frog that KSH! Its such a pretty cardi, I do hope you can sort it out. Yes, do keep working on it! It’s so pretty.